In this series, we will explore The Hungers of the Open Floor Movement Practice. 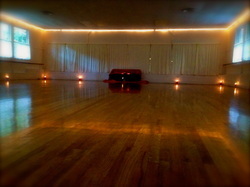 At the core of the Open Floor Movement Practice philosophy is the understanding that “we are always in relationship”. We hunger for it, whether it’s a hunger for solitude, connection with another, belonging to a group or connection to Spirit. Relationship is not something we do - it is something that we are. Understanding this and learning to embody and move gracefully with our deepest relational hungers makes life meaningful and rich. There are infinite ways to be in relation. We are always relating on every level, even when we avoid or isolate from ourselves, others, community or spirit. Join us for this committed series as we explore the relational hungers of life in a safe container with the same group of people each week. This class series counts as 8 hours of prerequisite and elective requirements for the Open Floor Teacher Training. In order to get the most out of this class series, it's helpful to attend as many classes as possible. Sorry, but there there are no discounts for missed classes.